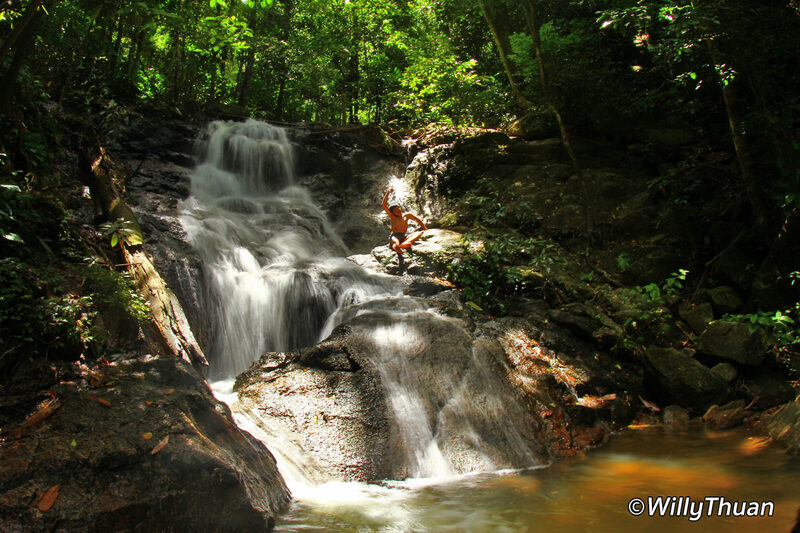 What to Do at Kathu Waterfall? 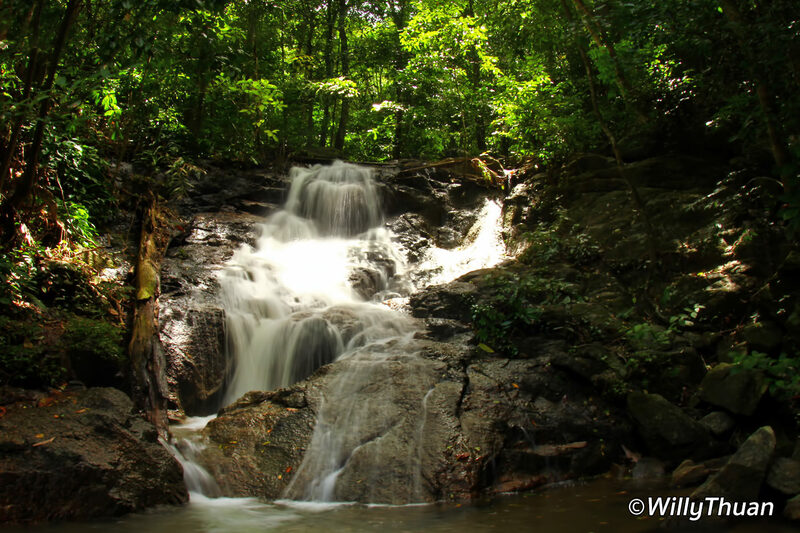 Kathu waterfall has an interesting story. For a long time, I thought it was just a tiny trickle, and most people would agree; this cascade isn’t worth a visit. But something wasn’t right, and I decided to give it a second chance, and I was right to do so, Kathu waterfall is worth a stop, as long as you go during the rainy season! The waterfalls itself is divided into two areas. 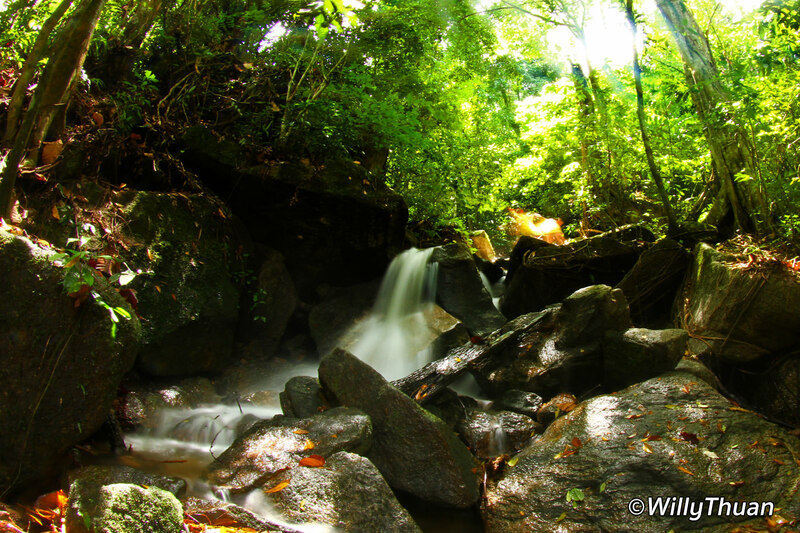 The one on the left is not much more than a stream of water creating a natural pool where kids love to play. The real falls are on the right from the parking, past a small bridge and up a 130 meters staircase. 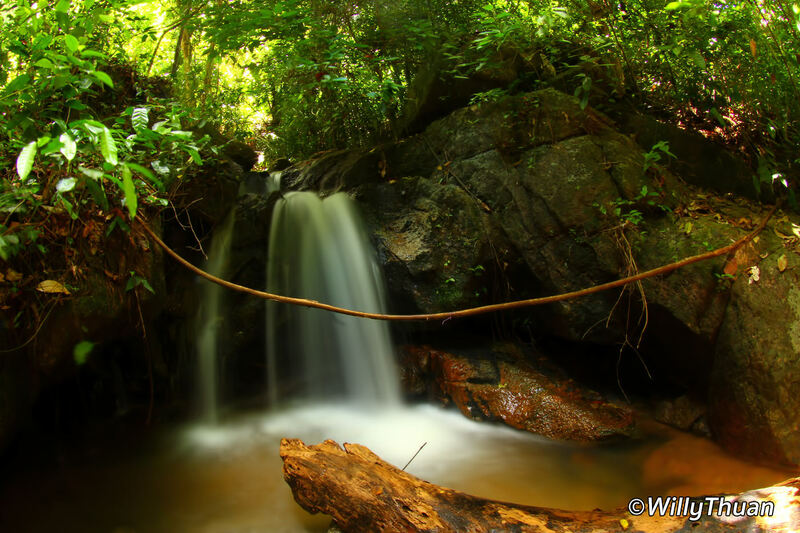 This first level of Kathu Waterfall is beautiful during the rainy season; a nice steady flow of water cascading down the rocks creates a large sandy pool. But don’t stop there, the second level still accessible via a concrete path is smaller but more natural. Teens love to hang around this one, picnicking and having a good time. If you are courageous, go to the third level using a dirt trail and to the fourth, but it requires a bit of rock climbing. These two later cascades are not big but very refreshing in the green shade of trees. 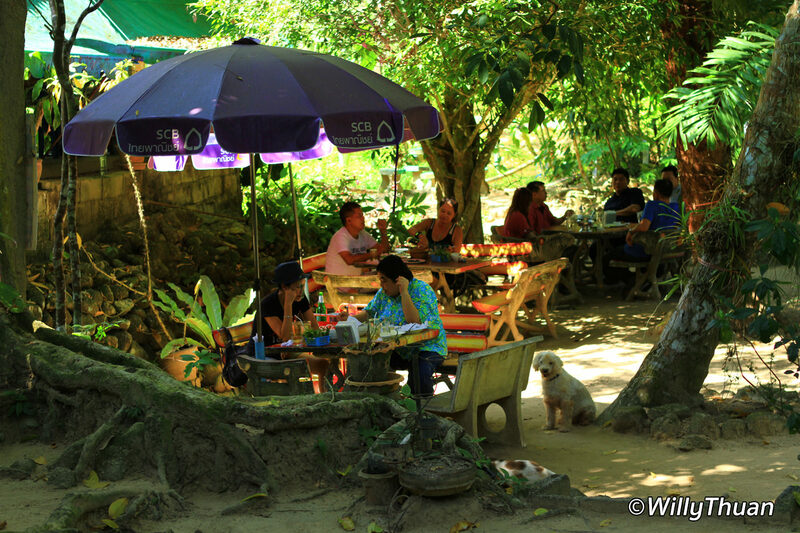 Once done with your jungle walk, consider having lunch at the waterfall restaurant called ‘Pai Lin Restaurant‘ (Blue Sapphire). 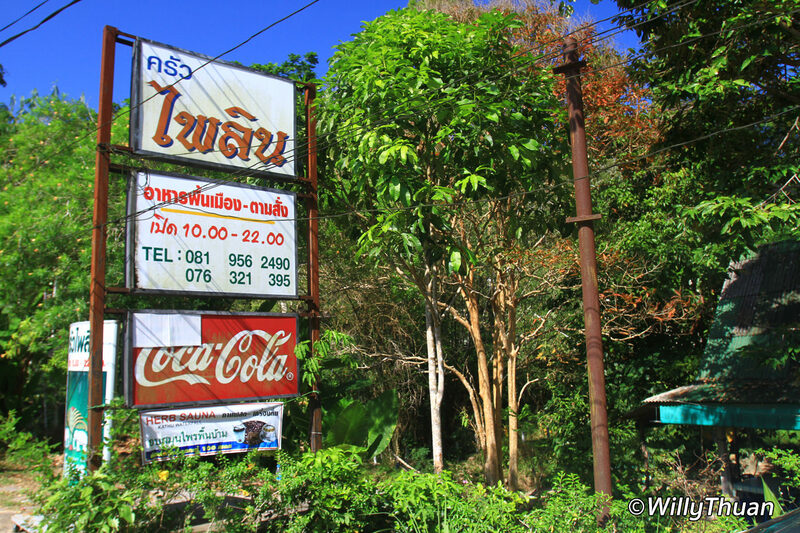 Pailin is a typically local Thai restaurant, great to try something different and good, just the way Thai people like it. Nothing fancy, just great food and chickens walking casually around the tables (if only they knew!). Well, the place does have an open kitchen, just like trendy restaurants have nowadays, and you should go have a look, the family cooking and running the restaurant is warm and friendly. If you decide to experience local cuisine, don’t go for classic dishes like I did the first times… they’ll be good, but not memorable. Go overboard and try things you can talk about once home, Here are the ones we had and it was excellent. ‘Moo Pa Pad Ped‘ (Wild Boar Curry) is my favourite, the taste and consistency of the meat are unique. ‘Nam Prik Phuket‘ (assorted boiled veggies with a spicy shrimp paste) is a local favourite and was good, less pungent than in other local shops which I usually don’t like. The ‘Kra Doo Moo Tom Cha Muang‘ (Pork soup with sour leaves) was delicious; the leaves are giving a light and unusual sour taste to the soup. Then ‘Pla Bilang‘ (Small deep fried fishes), deliciously crunchy without being too dry. Last but not least was the ‘Kai Mod Daeng Kua Glua’ (Fried red ants eggs) might be the most challenging, you really can see the ants and the big plump eggs. 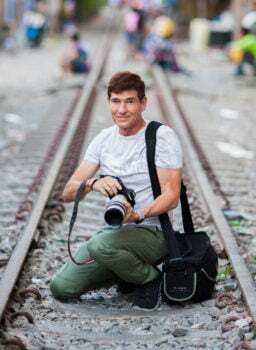 It was very nice, I guess have been in Thailand long enough to overcome the natural hesitation from our occidental education. The same dish also comes as a salad which tastes even better. The most exciting activity near Kathu Waterfall is without a doubt the Phuket Cable Ski, a fun but pricey attraction, great for almost anyone from kids to adults. For 700 baht an hour you can practice on a kneeboard around an oval-shaped lake, then once you are confident, try to stand on a wakeboard pulled by a cable moving at 26 km/h. It is quite intense and a great adrenaline rush. It also seems quite impressive when you fall off a few times before standing up on a board, but it is never painful. Just next to the cable ski and by the same owner is Palazzo, the most unlikely dinner show you would expect to find in such a remote location. 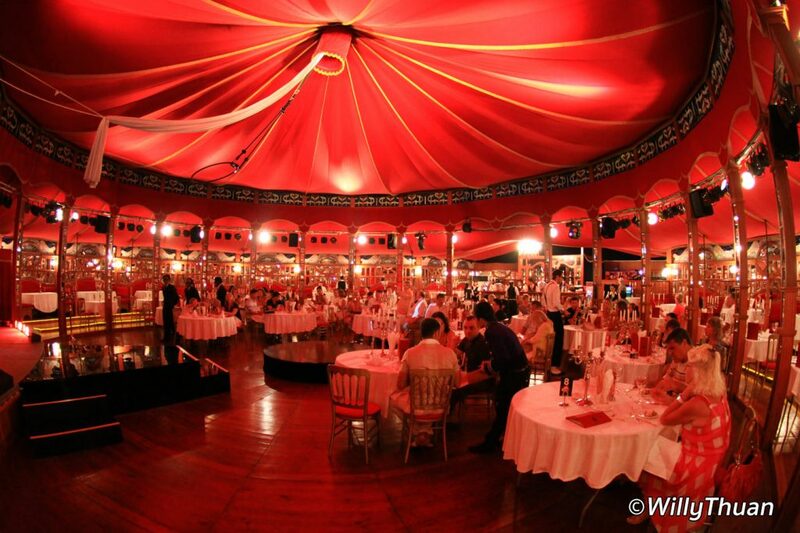 Show and dinner are set in a luxurious Art-Deco circus tent with tons of red velvet drapes… strange but fun. 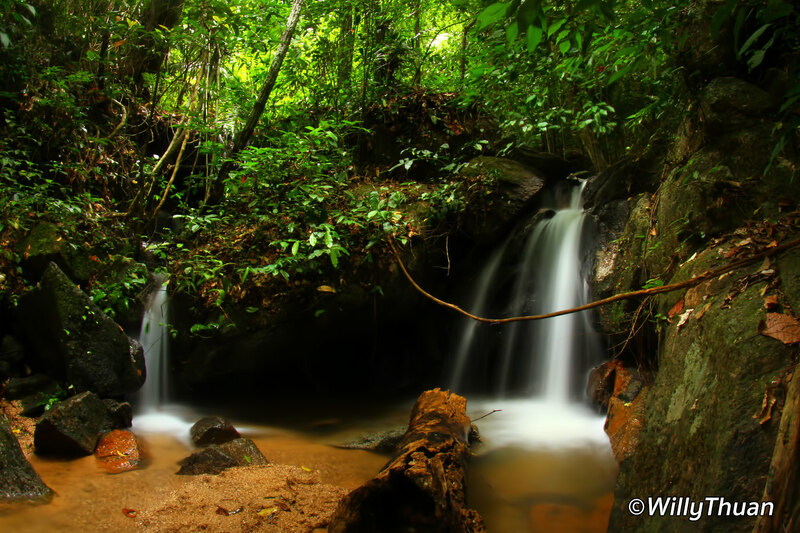 Another place worth mentioning in the same area is an excellent but rather shy ‘Royale Namtok‘, which translates ‘Royale Waterfalls’. The restaurant is tucked at the end on a tiny anonymous lane and is not advertising much, but we once had an excellent Valentine dinner there. So what is the verdict? 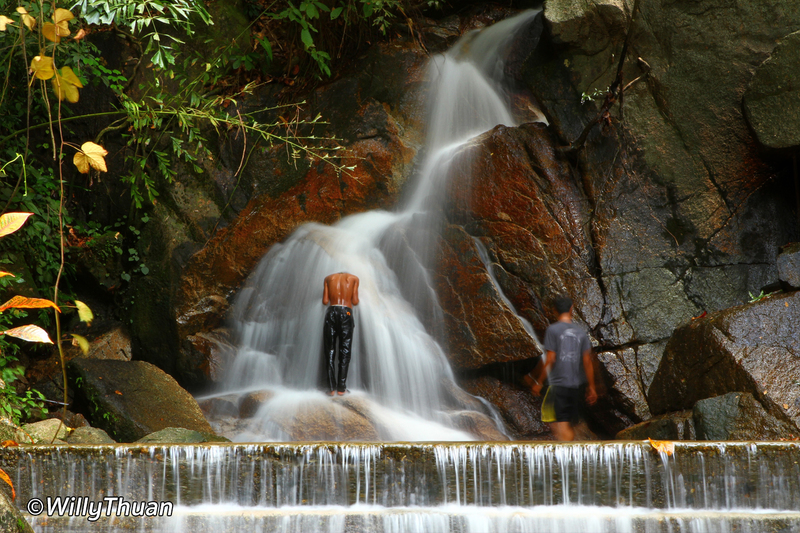 Kathu waterfall is nicer than Tonsai Waterfall and Bang Pae Waterfall, and at the contrary of these, there is no expensive national park fee to pay. 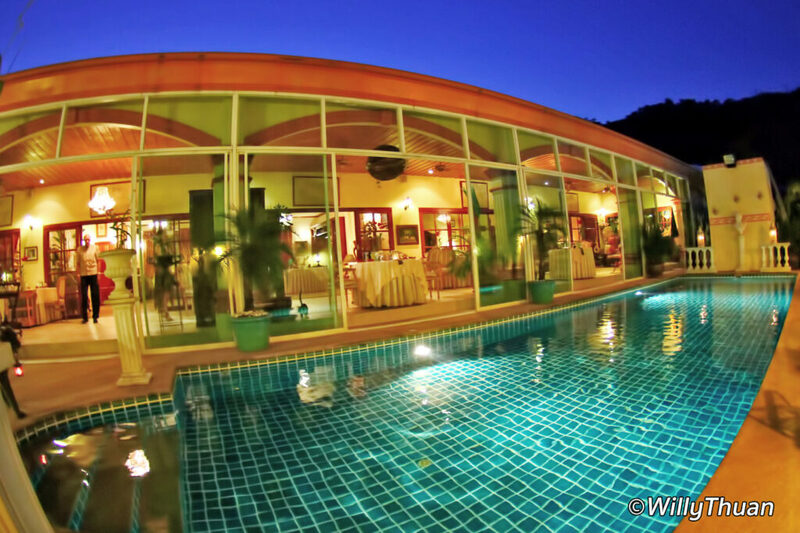 And to make the day perfect, also try some wakeboard and have lunch at Krua Pai Lin Restaurant.